Tamu, a Swahili word meaning "sweet" is a small village in Muhoroni, Kenya. The name is quite appropriate as Muhoroni is part of a commercial sugar production belt and Tamu is surrounded by plantations. It is in this village that Mama Joyce began the legacy of raising AIDS orphaned children in the family compound. Soon after Tamu Orphans Support Fund was created, we realized the home was not big enough to house all the children who needed help. Since a family-based environment seemed to work well, we decided to support additional children in their own villages with their own kin. ​This is the view from the front of the house where our sponsored children live in Tamu. A gate in the distance (center) is the main entrance to the property. Board member, Monica, visits our supported children in Kenya every year to check on their health and living conditions (Monica is an RN). Shown here are pictures from her 2011 visit when we accepted two new children into the Tamu home - Opiyo and Odongo, who are twins. Congratulations to our first High School graduate and first university student, Maurice! Maurice came to the Tamu home at the age of five. TOSF has supported him through primary, high school and now at the university level. Ouma has transitioned to independence. He lives in Kisumu where he lives and works as a mechanic. TOSF sponsored his primary education and vocational training to learn auto mechanics. He visits the Tamu home a couple of times a week where he helps with farming activities. Meanwhile, Susan studied hard and passed her high school exams. 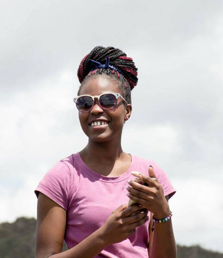 She is currently studying at Kenya Polytechnic where she is preparing for her university requirements. Susan was born and raised in the Tamu home. Nancy has grown into a mature young woman and is continuing with her course work to become a hairdresser and a beautician. In the meantime she has taken the responsibility of overseeing the Tamu home. Nancy was raised at the Tamu home since the age of four. From left to right, Nancy, Evans, Nicholas and Molly. In 2013, TOSF agreed to support a family of orphaned children living in Kano, Kenya. We are gratified that our supporters have enabled us to expand our mission to include these deserving children. Thank you! Tom at the orphanage school in 2016. Tom at his new high school in 2017. Tom was 14 when we started sponsoring his tuition. He had just passed his Primary School Examinations and admitted to a government sponsored high school – a coveted status in Kenya. Tom and his brother became AIDs orphans at a young age following the death of both parents, leaving no adult in their home. The neighboring villagers supported the orphans by providing food but could not afford to send them to school. Lillian who runs an orphanage in the slums of Kibera, Nairobi heard about their plight and took them under her care. They joined the orphanage school where they quickly adapted and excelled academically. Lillian requested help with both boys but TOSF could only afford to sponsor Tom. He continues to work hard and does well in high school.